In his 1998 book The g Factor, scholar Arthur Jensen used an extremely objective method to classify humans in different races: Varimax rotation of principal components applied to the genes of 42 populations studied by scholars Nei & Roychoudhury (1993). What I love about this is Jensen used the eigenvalues > 1 rule for determining the number of components to be retained for rotation. So based on “genetic similarity”, there are roughly six major races, though in the chart below (which I adapted from Jensen) I prefer to label all six using just three major anthropological types: Negroid, Caucasoid, and Mongoloid. Different ethnic groups have strong or weak loadings on the different components (races) and some load on multiple components, which as Jensen noted, reflect, central tendencies, not discrete categories. I find it interesting that Italians are the most Caucasoid of all Caucasoid ethnicities (clocking in at 989). Italians look like a hybrid of what I believe are the three Caucasoid sub-races: whites, dark caucasoids, and Ashkenazim; thus it makes sense that Italians are the essence of the Caucasoid race. It should be noted that genetic distance is measured using relatively neutral genes, which by definition are relatively insensitive to natural selection. It’s probably for this reason that sub-Saharan and Australoids get divided into different races, despite both being Negroid in appearance and IQ; because neutral genes primarily reflect the genetic clock (time since populations split) and not how truly similar folks are. So if you define race by how recently people shared a common ancestor, then this analysis should please you, but if you define race by how much people preserve the traits of a common ancestor, then an analysis using non-neutral genes is badly needed. Precious is an unbelievably heartbreaking film about a person named Precious who has every disadvantage one can have in America: She’s black, female, incredibly dark skinned, incredibly overweight, illiterate, dirt poor, physically abused, sexually abused, pregnant with her second baby, fathered by her father; The first baby has Down’s Syndrome! And that’s just the first 20 minutes of the movie! But other than that, Precious is not so different from other teenaged girls. She has a crush on her math teacher, she dreams of having a light skinned boyfriend with nice hair, but first she wants to be in one of those BET videos. So what is her IQ? At the start of the film we are told she is 16 years old and reads at a grade 2.8 level. Since people typically read several grades below their completed grade level, the average kid probably wouldn’t read at grade 2.8 level until grade 5.8 (about age 10.8), so at age 16, Precious had a reading age of 10.8 implying an IQ of 68 on the old age ratio scale 10.8/16 = 0.68. This makes sense because according to scholar Richard Lynn, the average IQ of the darkest skinned African Americans like Precious is 80 (white norms), but because Precious is also extremely overweight, and weight/height ratio is negatively correlated with IQ at about -0.22, Precious would be expected to be below this level. Indeed I estimate Precious to be 2.5 standard deviations above the mean of her age in weight/height ratio, so we might very crudely estimate her IQ to be 2.5 SD (-0.22) = -0.55 SD (roughly -8 IQ points) from what one might expect based on race and color alone. This reduces her IQ to 72 which is very similar to the 68 IQ as measured by her reading level. Both numbers round to 70. It seems simple regression works, even on fictional characters created by writers who know nothing about psychometrics or statistics, and probably don’t even believe in IQ! However watching the film, one gets the sense from her subtle sense of humour that Precious is smart despite her illiteracy, which is almost understandable given the abysmal quality of the inner-city schools she attends. “What are you a scientist now?” says Precious sarcastically. Once Precious leaves these ghetto schools and attends an alternative high school (which I also attended as a teenager; I’m now in my thirties) we see her reading level blossoms to a grade 7.8 level in about a year, thanks to the support of a loving teacher. The national average for American adults is 8th grade level, so this implies Precious now has an IQ around 100! Although this film is fictional, cases like this are not that uncommon. For example boxer Mike Tyson was considered borderline mentally retarded because of his low reading level, but under the tutoring of his boxing coach, his reading improved by about three grade levels in three months. Such anecdotes underscore the pitfalls of using academic SAT type measures to estimate IQs. Is there a secret black underclass? Hey Pumpkin? Are you 100% sure there is no secret super low IQ black under class? Because im here to tell you there is -.- You have obviously never seen just how degenerate the inner city is from first hand experience. I spent a great deal of my young adult hood traveling to the inner city from my suburban home, usually for excitement and easy women and I can tell you there is a large group of blacks that have IQ of 75 , possibly lower.The IQ of the homeless is 85. They form groups, a social heirarchy, and co-ordinate together to make what little money they can. I have seen this for myself. I swear on my life there are at least hundreds if not thousands of adult inner city black males that survive solely on robbery and theft and their females survive of the meager financial support from the male activities. Tell me Pumpkin, What would the IQ be of someone who could only think of theft or robbery to make money. Theres a large amount of blacks that get away with this behavior constantly because in the inner city theres little to no police enforcement. The inner city is essentialy a modern day African Savannah. Its called a concrete jungle for a reason. Please do more research on a plausible theory before dismissing it. I do agree that there are subpopulations of U.S. blacks with IQs below 75. For example scholar Arthur Jensen discovered an entire school district in rural Georgia where the average IQ of late adolescents was about 70. The question was whether these secret subpopulations are large enough to drag the national black IQ average down to 78, instead of the mean of 85 that is typically reported. One reason for my skepticism is that tests like the Wechsler scales attempt to get extremely representative samples. For example, the 1995 U.S. census reported that 18% of college age blacks had less than a high school diploma (about one fifth); meanwhile 21% of college age blacks in the 1995 norming of the Wechsler adult IQ test also had less than a high school diploma (also about one fifth). Such careful matching of demographic variables gives me confidence that Wechsler norms are valid. On the other hand, there is enormous IQ variation even among people with the same education, and this is especially true of blacks, so just because the Wechsler scales fully sampled low education blacks, does not mean they fully sampled low IQ blacks. It is widely known among test developers that although samples are carefully drawn to create a nationally representative sample for the entire population, they are not chosen to get an accurate estimate for subgroups such as Blacks. The most disadvantaged elements in poorer schools in inner cities are rarely, if ever, included. Thus I decided to take Mikey Blayze’s advice and do more research. Although there are probably few if any studies on the IQs of poor inner city blacks, I did find a paper on the prison population in the Southern United States. The paper reported that the white prisoners averaged IQ 87.66 on the WAIS-R, while the black prisoners averaged 78.47. However because the WAIS-R was normed in 1978 and the prisoners were apparently tested in 1987, we should probably deduct 2.7 points for inflated norms (the Flynn effect), which reduces the IQs to 84.96 and 75.77 respectively. It should also be noted that WAIS-R IQs are reported with reference to the entire U.S. population, not just the white population, which averaged IQ 101.4 SD = 14.65 on U.S. norms. Compared to the national white mean and SD, white prisoners were -1.12 SD and black prisoners were -1.75 SD, corresponding to IQs of 83 and 74 respectively, using white norms. Since the black inner city tends to have very high incarceration rates, the IQ 74 of black prisoners might be representative of the black underclass. This is a bit higher than the rural Georgia black teens who averaged IQ 70. On the other hand, a study of almost all black homeless people in Milwaukee showed an average IQ of 80 (white norms). Averaging black prisoners in the South (IQ 74) with mostly black homeless in Milwaukee (IQ 80) with black teens in rural Georgia (IQ 70) probably gives a reasonable estimate of the IQ of the black underclass, and that estimate is 75 (white norms). If the black underclass average IQ 75, it makes sense that the average U.S. black is about IQ 85 (white norms) and that the Wechsler samples are probably correct despite probably not sampling inner city blacks. Were Native Americans too smart to be slaves? Native Americans were respected because they lived in the Americas, which Whites viewed as a paradise. The Garden of Eden. By contrast Blacks lived in the thick dense burning hot jungles of sub-Sahara, surrounded by incects and massive snakes. Whites viewed Africa as hell on Earth. Native Americans were reddish in skin tone, and that’s a colour Whites respected. By contrast, Blacks were blackish in skin tone an that’s a colour Whites (and all races) associated with darkness and evil. Englishmen discovered Blacks at the same time they discovered chimpanzees, and in the same place: Africa. This caused scientists to look for similarities between Blacks and monkeys such as prognathism. And so it is for these three reasons that Blacks were considered subhuman enough to be slaves, but Native Americans were considered noble savages who reminded Whites of their own ancestral past. …Indians proved quite adept at escaping, and when this happened they faded into the landscape; it was extremely difficult to retrieve runaway Indians who knew the territory. By contrast, Africans could run but they could not easily hide. So in sounds like Whites got so tired of being constantly outsmarted by their Indian slaves that they risked their lives traveling all the way to Africa to find slaves who couldn’t outwit them. This might explain why Native Americans, despite being the most socially and economically disadvantaged people in society, score 10 IQ points higher on the SAT than African Americans do, even though African Americans are part White. If African Americans did not have White admixture, they might score close to a full standard deviation behind Native Americans. Scholar J.P. Rushton argued that Mongoloids were more genetically advanced than Caucasoids who were more genetically advanced than Negroids. Rushton believed this because Mongoloids were the newest race, and had the most ice age exposure, while Negroids were the oldest race, and had the least ice age exposure. I find it interesting that even the least intelligent form of Mongoloid (Native Americans) outsmarted the most intelligent form of Caucasoid (Europeans), during slavery. I also find it interesting that Native Americans were able to independently create a civilization, something not even Whites did! One problem is that although the SAT is given to an enormous sample of Americans, it is not given to a representative sample of Americans. Only about the most academically successful third of American 17-year-olds take the SAT, however one might crudely adjust for this filtering. If anything, the chart above overestimates the general population score gaps between different races, because it assumes a 7 point IQ gap between the SAT population and the general population in every race, but in non-Asian minorities, that gap could be larger because a smaller percentage of those races go to college, and thus the college bound elite are even more filtered for ability. It should be noted that the relatively small gap between Whites and Asian Americans might be because (1) the SAT does not emphasize spatial ability, and (2) Asian Americans are not equivalent to East Asian Americans, but include non-white caucasoids and southeast Asians who have australoid admixture. Does IQ explain racial differences in extreme wealth? Despite being 13.6% of America, Blacks are typically only 0.25% of the Forbes 400 (Oprah), though some years as much as 0.5%. 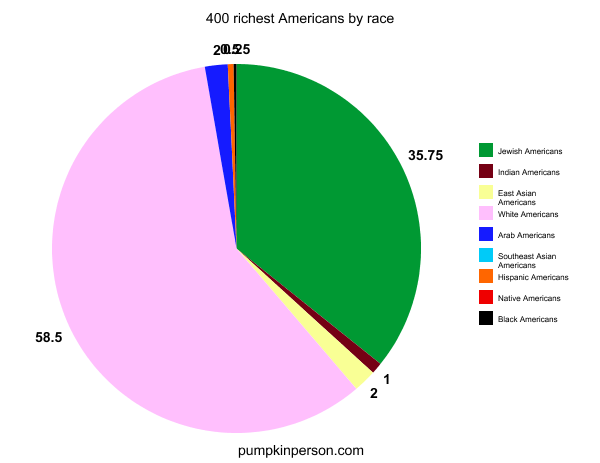 Meanwhile, despite being only 2% of America, Ashkenazim are estimated to be 35.56% of the Forbes 400. Some might dispute these numbers on the grounds that partial Jews get counted as Jews, however this is counterbalanced by the fact that many full-Jews probably get mistaken for Gentiles. Further, partial Jews are often counted as Jews for census purposes, so counting them as Jews maintains consistency, though admittedly, this is not an exact science. 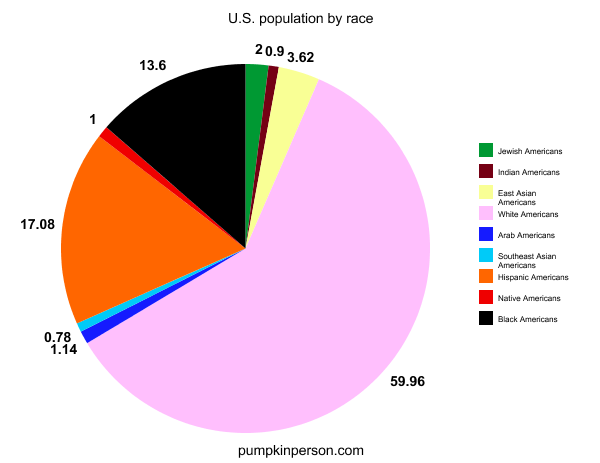 On a scale where the average White American has an IQ of 100 (SD = 15), I assume the average American has an IQ of about 97 (SD = 15.5) and the average Jewish American has an IQ of 110, and the average Black American has an IQ of 85. This means that the average Ashkenazi America scores 0.84 SD higher than the average American and the average Black American scores 0.77 SD lower than the average American. If IQ correlates about 0.4 with cumulative life time earnings, and if IQ causes income, either directly, or via credentials, then Jews having IQs 0.84 SD above the U.S. mean should cause financial success that is 0.84 SD(0.4) = 0.34 SD above the U.S. mean. Now assuming there are about 242 million American adults, and only 400 of them make the Forbes 400, then making the Forbes 400 requires wealth at or above the top one in 605,000 level. In other words, normalizing the distribution of financial success, you need to be at least 4.67 standard deviations more financially successful than the average American to make the Forbes 400. However based on IQ alone, the Jewish income distribution should be 0.34 SD above the U.S. mean, thus the Forbes 400 requires one to be 4.67 SD – 0.34 SD = 4.33 SD above the Jewish financial mean. In other words, based on IQ alone, one in 136,074 Jewish Americans should make the Forbes 400, compared to one in 605,000 Americans in general. Assuming there are about 4.84 million Jewish adults in America, this suggests that 4,840,000/136,074 = 35.57 Jews should be on the Forbes 400 (roughly 9% of the list). Instead Jews are roughly 36% of the Forbes 400. This shows that even controlling for IQ, Jewish Americans are overrepresented among the super rich by a factor of four. However before controlling for IQ, they are overrepresented by a factor of 18. This shows IQ can explain 78% of Jewish overrepresentation, with only 22% unexplained. If IQ correlates about 0.4 with cumulative life time earnings, and if IQ causes income, either directly, or via credentials, then Blacks having IQs 0.77 SD below the U.S. mean should cause financial success that is 0.77 SD(0.4) = 0.308 SD below the U.S. mean. Now given that you need to be at least 4.67 standard deviations more financially successful than the average American to make the Forbes 400, and based on IQ alone, Blacks should have an income distribution shifted 0.308 SD to the left of Americans in general, the Forbes 400 requires one to be 4.67 SD + 0.308 SD = 4.98 SD above the Black financial mean. In other words, based on IQ alone, only one in 3,483,046 Black Americans should make the Forbes 400, compared to one in 605,000 Americans in general. Assuming there are about 32.912 million black adults in America, this suggests that 32,912,000/3,483,046 = 9.45 Blacks should be on the Forbes 400 (roughly 2% of the list). Instead Blacks are typically only 0.25% of the Forbes 400 (Oprah). This shows that even controlling for IQ, Black Americans are underrepresented among the super rich by a factor of eight. However before controlling for IQ, they are underrepresented by a factor of 54. This shows IQ can explain about 85% of black underrepresentation, with only 15% unexplained. IQ explains 78% of Jewish overrepresentation in extreme wealth, and 85% of black underrepresentation. What explains the rest? The most obvious possibility is some kind of multiplier effect. What I mean is that because the IQs of one’s family members tend to regress 40% to the mean of their race, a Black with an IQ of 140, will tend to have parents with IQs of 118, while a Jew with an IQ of 140 tends to have parents with IQs around 128. Thus, even when Blacks have the same IQs as Jews, Jews still have the advantage of higher IQ family members to give them career advice, lend them money, etc. Another obvious possibility is that other traits, either cultural or genetic, may gives Jews an advantage when it comes to making money, such as more stable families, lower incarceration rates, and a tradition of entrepreneurialism. A final possibility is that Blacks suffer from anti-Black discrimination and Jews benefit from philosemitic discrimination. This would be mitigated to some degree by affirmative action for blacks. However a discrimination model is hard to square with the fact that Blacks do much better on measures of fame and popularity than they do on wealth, while for Jews it’s the opposite. Earlier this week I watched the 1992 film School Ties starring Brendan Fraser, Matt Damon, Ben Affleck, Chris O’Donnell, Cole Hauser, Randall Batinkoff, Andrew Lowery and Anthony Rapp. The film is about an extremely prestigious Ivy League prep school that is so desperate to win a football game, that they break nearly two centuries of tradition and allow a Jewish student to attend because he’s an excellent athlete. The Jewish student, David Greene, played by Brendan Frasier, conceals his Jewish identity from his classmates, who hero-worship him for winning football games against rival schools, but when his secret is revealed, he goes from being the most popular guy on campus to an utter pariah, overnight, getting dumped by his beautiful blonde blue-eyed Gentile girlfriend who is suddenly too repulsed to kiss him. Ironically, one of his biggest tormenters is some scrawny nerdy kid with glasses played by Anthony Rapp who looks like a teenaged Bill Gates. The nerd taunts Greene by pretending to sneeze, but instead of saying “hachoo” when he sneezes, he says “a Jew”. It was a bit unrealistic that a nerd would be the most anti-Semetic character in the film since anti-Semitism requires the kind of disgusting cynicism that naïve, borderline autistic nerds tend to lack. The film shows the despicable levels of anti-Semitism that existed in the 1950s before Jews used their high verbal IQs to transform the culture by dominating the media and academia. The most annoying scene in the film was when the student played by Matt Damon says “good schools, good grades, connections…these are the keys to the kingdom. None of us makes it on our wits.” Even in a film made way back in 1992, we see this annoying idea that success in life is entirely predetermined by college, and that real-world intelligent behavior is irrelevant. It seems that scientists and bloggers in the fields of evolutionary psychology, behavioral genetics and anthropology can be divided into three camps: HBD deniers, HBD moderates, and HBD extremists. HBD deniers: These are people who believe that intelligence and other mental traits did evolve in humans, but it generally took hundreds of thousands of years for significant changes to occur, thus while different species within the genus homo may differ genetically in intelligence and other mental traits, there are no (or few) such significant differences between races. Most scientists are HBD deniers, at least publicly. HBD moderates: These are people who believe that intelligence and other mental traits did evolve in humans, but it generally took tens of thousands of years for significant changes to occur, thus while different races within the species homo may differ genetically in intelligence and other mental traits, there are no (or few) such significant differences between ethnic groups within races. People like J.P. Rushton, Arthur Jensen, Michael Hart and Richard Lynn are probably mostly in the HBD moderate camp, since they often link population differences in behavior to ancient long lasting forces like exposure to the ice age, and feel it took 50,000 to 110,000 years for the 15-20 point black-white IQ gap to evolve. HBD moderates get attacked by HBD deniers for focusing on racial differences instead of the less controversial ethnic differences, and they get attacked by HBD extremists for ignoring all the recent evolution the extremists assert. HBD extremists: These are people who believe that intelligence and other mental traits did evolve in humans, and it took only thousands or even hundreds of years for significant changes to occur, thus even very similar ethnic groups within the same race show large genetic differences. An example of this view is the book The 10,000 year explosion which argued that a 10+ point IQ gap between Ashkenazi Jews and the Caucasoid gentiles they split off of, evolved in only 800 years! Most of the HBD blogosphere would fall in the HBD extremist camp, regardless of whether they focus on intelligence, or other behavioral traits. Are too many U.S. blacks scoring high on IQ tests? Consider black Americans. If their mean IQ is one std lower than whites, while the width of their distribution is lower (12 points instead of 15) – then for them the NMSPQRT threshold is 4.475 standard deviations. Instead of 1 in 200, the fraction of winners is less than 1 in 200,000. This is too simple: IQ can’t be exactly Gaussian, blacks in the US are not perfectly homogeneous, etc. But it does show the trend: such high scores are much, much, much rarer in groups with low mean scores. It’s also the case that any black kid with such a high score would get a far better offer from Harvard. Hate to brag— okay no, I don’t, I love bragging— I’m black and was a National Merit Finalist. Granted, it was in a southern state with a low cutoff score. Strangely enough, out of about a dozen people in my school who made it to the semifinalist level, three of them were black (me and two black females). But given the stats cited above and other anecdotes, the blogger found Judah-sphere’s claim very had to believe. …As of 1994 there were approximately 32.8 million blacks in America. If the estimate is computed based on the mean IQ (86.7) and standard deviation (12.4) of blacks in the NLSY, a table of the normal distribution indicates that only 0.1 percent, or about 33,000, would have IQs of 125 or higher. If one applies the observed distribution in the NLSY and asks what proportion of blacks are in the top five percent of the AFQT distribution (roughly corresponding to an IQ of 125), the result, 0.4 percent, implies the answer is about 131,000. There are reasons to think that both estimates err in different directions. We compromise with 100,000. I wish they had elaborated on what reasons there are to think both estimates err in different directions! On page 454 of The Bell Curve, they note that in 1993, “only 129 blacks, 234 Latinos nationwide had SAT verbal scores in the 700s–and these represented all-time highs–compared to 7,114 whites.” They are referencing the older, much harder version of the SAT that existed before the re-centering of the scale circa 1995. Back in 1993, there were probably only 3 million 17 year-olds in America (including perhaps 2.25 million whites and perhaps 360,000 blacks), and virtually 100% of the brilliant ones wrote the SAT. Thus, if 7,114 out of 2.25 million white 17 year olds scored 700+ on the verbal SAT (one out of 316), then, on a scale where white America averages 100 with an SD of 15, this can be roughly equated to a deviation IQ of 141 (just over the national merit level). Now, if on the same scale, U.S. blacks supposedly have a mean of 85 with an SD of 12, the Gaussian curve predicts that of the perhaps 360,000 African American 17-year-ods in 1993, only one of them should score 139, and not a single one should score 140+. Instead 129 scored 141+. How do we explain this? Perhaps the old SAT is not normally distributed at the extremes. I forced it to fit the bell curve among whites which meant 700+ was assigned an IQ of 141 ( based on the fact that only one in 316 whites corresponds to the +2.73 SD level on the normal curve), but in reality, when representative samples of all U.S. white teenagers (not just the college bound segment) took the old verbal SAT as part of norming studies, a score of 700+ was actually over +3 SD from the mean because the true distribution is not perfectly normal, and departure from normality likely gets worse the more you deviate from the mean of your race. I suspect this problem is largely limited to highly crystallized tests like the SAT and AFQT. Because these tests are measuring cultural learning in addition to biological ability, there’s no reason to expect them to perfectly fit the Gaussian curve, which is largely limited to biological distributions. Although it’s sometimes suggested that culture loaded tests are more heritable than culture reduced ones, several studies have found the opposite. And of course there’s more to biology than just genes. A second possible explanation was perhaps alluded to by the West Hunter blog: blacks in the US are not perfectly homogeneous. For example, the brilliant Steve Sailer notes that roughly 10% of U.S. “blacks” are of predominantly non-black ancestry. So even though African Americans as a whole might have a mean IQ of 85 and an SD of 12, these aggregate statistics obscure the fact that 10% of African Americans are mostly white at the genetic level, and thus probably have a mean around 93 and an SD around 14. This hyper-hybridized subset might have their own bell curve, which might partly explain the unexpectedly high number of brilliant blacks. A third possibility is these high scoring blacks are not just hyper-hybridized black Americans but rather the best and brightest from Africa, taking the SAT as foreign students or as children of the most elite immigrants. A fourth possibility, which I find unlikely, is that a century of statistics are wrong, and that the African American mean and SD are not 85 and 12, but rather 78 and 15+. Before they died, scholars Jensen and Rushton speculated that virtually all testing of U.S. blacks ever done excluded a large underclass of blacks. These would probably be the most dark-skinned Negroid featured blacks in the heart of the ghetto, in schools no white psychologist would dare give an IQ test, but if they would, they might find scores of only 70 or even 50, which would drag the overall U.S. black mean down to 78, while expanding the SD enough to explain high IQ blacks at the opposite extreme. A final possible explanation for the large number of brilliant blacks is that the general U.S. black mean and SD is artificially lowered by bad environment, and only the best and brightest blacks are largely privileged enough to overcome the bad environment and reach their genetic potential. As an HBDer, I find this unlikely, but possible. I analyzed the racial background of the 20 U.S. physicists to win a Nobel prize in the 21st century, and found that 15% are East Asian, despite the fact that East Asians are only 3.62% of the U.S. population. This undermines the claim that East Asians lack originality. Jews did even better. Despite being 2% of America, they are 30% of its 21st century Nobel physicists. The remaining 55% of 21st century U.S. Nobel physicists are white. It is interesting to ask what, if anything, this racial breakdown tells us about the IQs of Nobel physicists. Although U.S. Jews have an average IQ of 110, if the correlation between IQ and race were perfect, Jews would average 130. That’s expected because the correlation between IQ and race is 0.43, so 0.43 standardized regression slope means Jews are only about 43% as far above the U.S. mean of 96 as they would be if the correlation were 1.0. Similarly, if the correlation between IQ and race were perfect, East Asian Americans would have an IQ of 115 instead of 104, and Whites would have an IQ of 106 instead of 100. An IQ of 115 is 19 points above the U.S. mean of 96. Of course race and IQ are not correlated perfectly. As mentioned above race correlates 0.43 with IQ and probably 0.48 with g (the general factor of intelligence). So people selected based on g (among other traits) will regress to the U.S. mean on “race IQ” via the 0.48 regression slope. So if they are 19 points above the U.S. mean on “race IQ”, they would be 19/0.48 = 40 IQ points above the U.S. mean on g.
But since IQ tests only correlate 0.9 with g, they’re likely 0.9(40) = 36 points above the U.S. mean of 96 on IQ, which means the average Nobel physicist should have an IQ of 132. I’m not saying that is the IQ of Nobel physicists, I’m just saying it’s what we should expect based on the fact that they are 30% Jewish, 15% East Asian and 55% White. But it’s likely an underestimate because the average IQ of physics PhDs has got to be close to 130. For the top physicists in America to score no higher would imply zero correlation between IQ and job performance among physicists, which sounds impossible. Also, we know from the Roe study that physicists and other elite scientists averaged IQ above 155, though that was in the 1950s when academia was more meritocratic. Still, it’s doubtful their IQ could have dropped that much in the last half century. 1) although Jews have high overall IQs, they are more verbally oriented, so their overrepresentation is much more extreme in business and especially media than it is in science, so physicists don’t have as many Jews as occupations that actually shape the culture. 2) East Asians would be even more overrepresented but their extreme mental stability and cautious temperament limits creativity, and Ivy League discrimination against East Asians limits how many can dominate in academic fields.